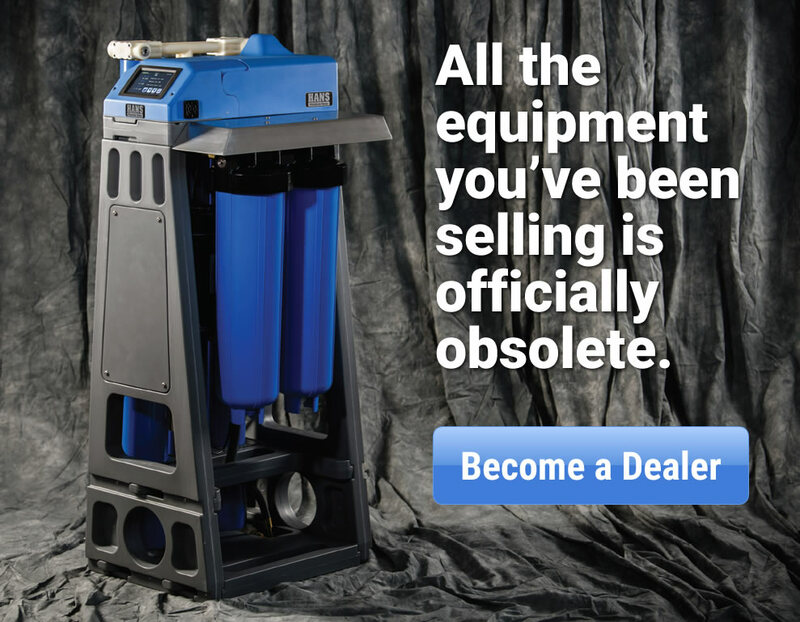 The quality of post-mix beverages is often highly dependent on the quality of the water treatment equipment installed and operated upstream of the post-mix machine. The locally available tap water that is mixed with CO2 and concentrated beverage syrup to produce our favorite soft drinks onsite may have certain characteristics that require treatment. If that locally available tap water has characteristics that will negatively affect the appearance, odor and/or taste of the soft drink, this may result in unacceptable quality of the post-mix beverage. 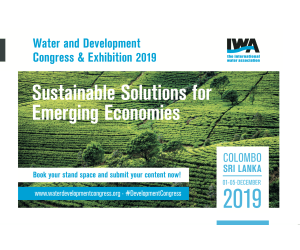 Recognizing this opportunity to contribute value through improving beverage quality, treatment manufacturers have developed specialized product lines focused around treatment of water used in post-mix beverage applications. 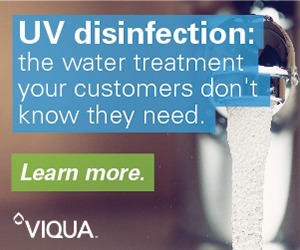 Locally available tap water can contain excess particles and sediment, residual disinfectants at concentrations above the taste threshold, significant hardness, high TDS and possibly other contaminants that can affect post-mix beverages. 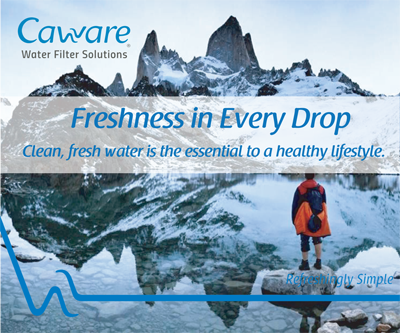 As such, water treatment for post-mix beverage production can include sediment filters, carbon filters including carbon blocks and granular activated carbon, scale control cartridges, RO and hollow-fiber membranes. 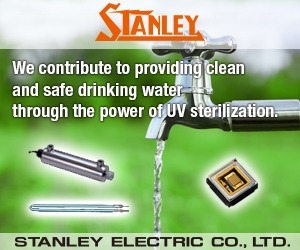 Additionally, some applications may include softening, UV and/or ion exchange. 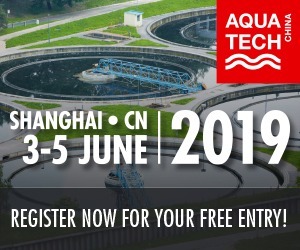 Application of these technologies is optimized by water treatment professionals utilizing data describing source water characteristics and on water characteristics desired for the particular post-mix beverage dispensing application. Beverage producers have typically evaluated water sources and levels of water quality and effects on quality of the resulting post-mix beverages. Through these evaluations, they have developed guidelines for optimal water chemistry for their specific products. These beverage producers know exactly which commonly varying aspects of water chemistry influence the taste of their beverages, both positively and negatively. 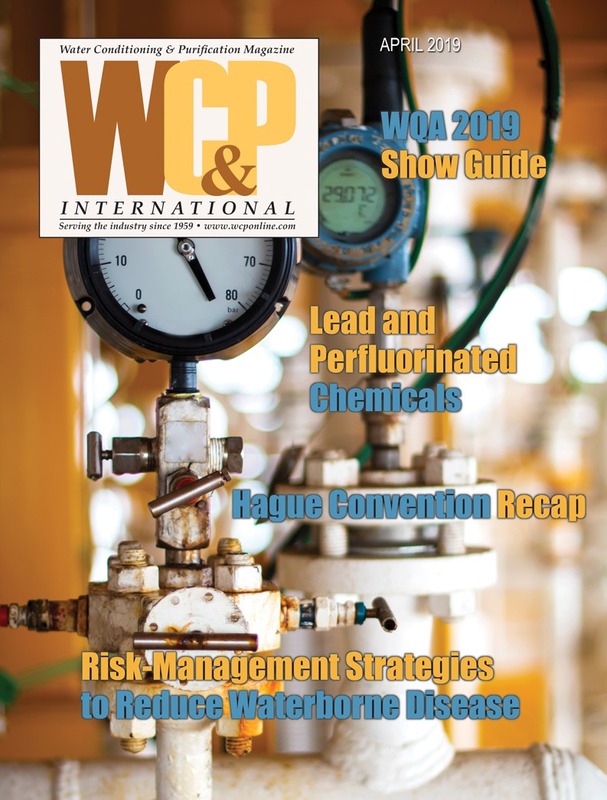 Leveraging this information, along with knowledge about water treatment technologies, has led manufacturers of water treatment equipment to the development of highly specialized products for post-mix beverage applications. 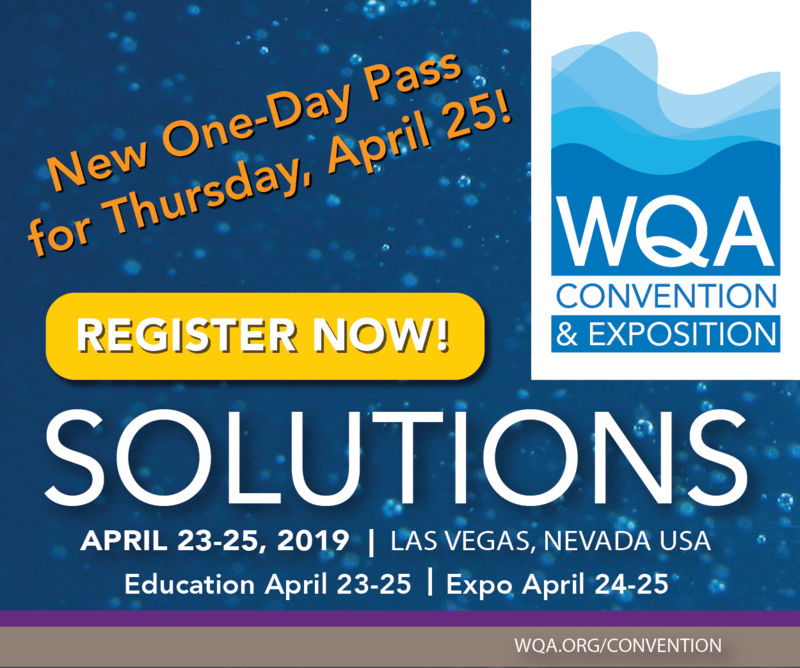 Likewise, water treatment professionals have learned how to best apply these technologies to various conditions of source water to achieve desired treated water quality. Requirements for post-mix, commercial modular water treatment systems were first introduced into NSF/ANSI 42 in 2005. These requirements are specific to the types of equipment utilized in post-mix systems. 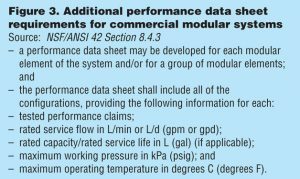 The definition of commercial modular water treatment systems (Figure 1) makes it clear that these requirements were developed specifically for post-mix beverage dispensing applications. This definition makes it clear that commercial modular systems are not intended to be used in consumer installations. 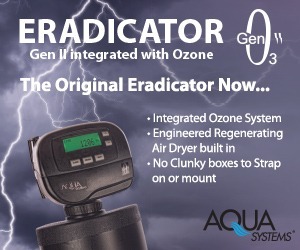 The reason for this restriction is that these systems are configurable in the field by qualified water treatment professionals to customize the installation to provide quality water in a variety of local water conditions. Commercial modular systems typically include an array of possible treatment elements that can fit into specially designed manifolds to provide highly configurable treatment systems. This open-ended configuration would be very confusing to consumers and could allow them to unintentionally end up with some inappropriate and ineffective installations. For example, a consumer could end up accidentally installing two dissimilar modular elements in a parallel flow configuration, thus leading to uneven flow, bypass and incomplete treatment. Proper installation and application of commercial modular systems is critical to their effectiveness, which is addressed through the standard requirement that these systems be installed exclusively by an authorized plumber or authorized agent of the manufacturer. The standard requires that this provision be communicated directly on the modular elements themselves (Figure 2). 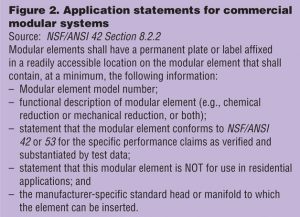 NSF/ANSI 42 is structured this way in order to allow for a clear method of evaluation for these systems, which can have so many permutations of configurations that application of typical standard requirements can become unclear. 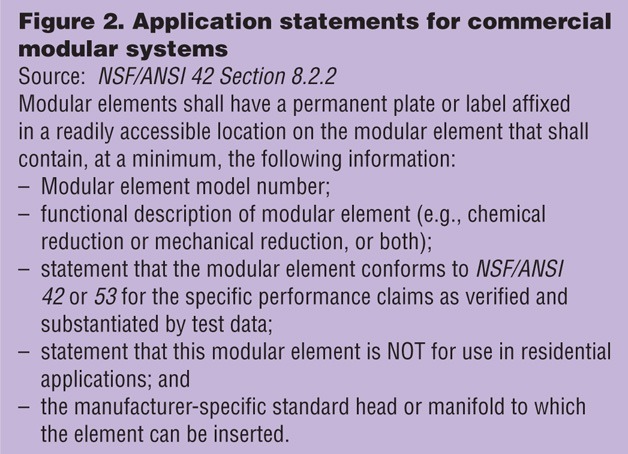 This approach includes the ability of the manufacturer to provide claims and capacity information specific to a modular element on the element itself, as opposed to attempting to identify and uniquely name and label each possible system permutation associated with a given manifold system. Additionally, the manufacturer then has the option to provide a performance data sheet for each modular element, instead of being required to develop a performance data sheet for each possible system permutation. This approach leads to much fewer performance data sheets being necessary and therefore greater simplicity and clarity. 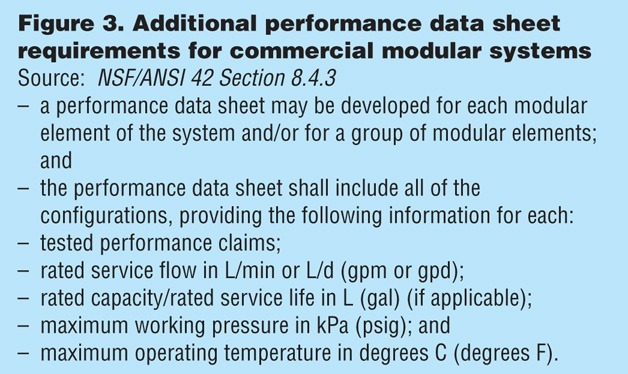 Information specific to these modular systems is required to be included in the performance data sheet for these modular elements or systems (Figure 3). • Conformity assessment beyond a single point in time. Testing is an evaluation at only one point in time. A simple test does not address changes to the product over time, whether those changes be intentional on the part of the manufacturer or unintentional changes brought about by the supply chain and unbeknownst to the manufacturer. Some of these changes can significantly impact conformance of the product to the standard. Certification includes evaluation of product changes through documentation requirements, manufacturing facility audits and periodic product retesting. • Evaluation of all relevant product attributes. 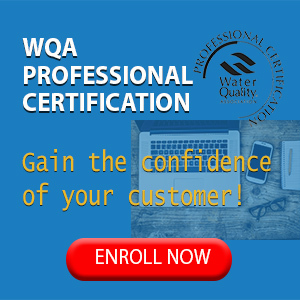 Certification requires testing of multiple attributes of a product, including safety of materials in contact with drinking water, structural integrity and contaminant reduction, as opposed to a single test focusing on a single product attribute. Certification also helps assure that product specifications and use instructions are adequately and clearly communicated to the professionals who are installing and maintaining these complex systems. • Independent accreditation. Accredited third-party certification means that an accreditation body is assessing the certification to assure that it is handled appropriately and that all requirements of the certifier’s policies and the accreditation standard are being met through the certification. So, there is oversight on the third-party certifier as a greater assurance of quality in the certification and evaluation process. 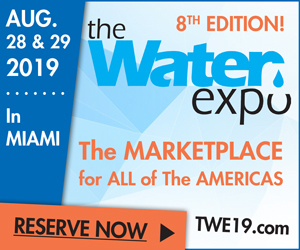 Recognizing market needs, water treatment manufacturers have developed sophisticated and specialized treatment technologies for post-mix beverage dispensing applications. 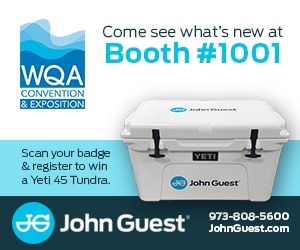 They allow qualified water treatment professionals to configure systems that help assure consistent quality and pleasing taste for post-mix dispensed beverages. The combination of effective treatment technology and water treatment expertise is what provides this desired outcome of consistent, high-quality post-mix beverages. If one or the other element is missing, the result may not be as positive. Accredited third-party certification of post-mix water treatment equipment to the NSF/ANSI DWTU Standards is a comprehensive approach to assuring product quality. Certification provides ongoing evaluation that the treatment products conform to the full requirements of the standard, including safety of materials in contact with water, structural integrity, contaminant-reduction performance and clear labeling and presentation of product specifications and use instructions.